Those with at least a passing interest in gospel music are likely familiar with electric guitar- wielding evangelist Sister Rosetta Tharpe, who quite unintentionally became known as “the godmother of rock & roll.” In fact, she will be inducted into the Rock and Roll Hall of Fame this month in recognition of her wide ranging influence on rock music. Fewer, however, may be acquainted with the career of Marie Knight, aside from her brief partnership with Tharpe in the late 1940s which produced the hit songs “Up Above My Head” and “Didn’t It Rain.” Of course Knight’s career encompassed far more than her work with Tharpe. As a child she sang for COGIC congregations throughout the Northeast, went on to record with The Sunset Four, and enjoyed a successful solo career performing and recording gospel as well as R&B music. Knight stopped singing professionally in 1980, but was lured back into the studio two decades later by Mark Carpentieri of M.C. Records, who asked her to record “Didn’t It Rain” for the Rosetta Tharpe tribute album, Shout, Sister, Shout (a companion to the book by Gayle Wald). She went on to record an album of Rev. Gary Davis songs for Carpentieri, who became her manager, and began touring once again. Regrettably, Knight’s newfound success was cut short in 2009 after suffering a stroke, and she died shortly thereafter. The Gospel Truth Live is Carpentieri’s posthumous tribute to Knight. The album features gems culled from her performance at the Massachusetts College of Liberal Arts’ 2007 Gospel Fest, held at the Church Street Center in North Adams, MA. 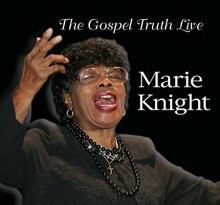 Knight was 87 at the time, one of the last living artists from the “Golden Age” of gospel. After a lengthy standing ovation, Knight comes on stage and opens with Rev. Gary Davis’s 1935 classic “I Belong to the Band” with the audience enthusiastically clapping along. As the concert continues, Knight segues between the Rev. Davis classics she had recently recorded—“12 Gates to the City,” a rousing “I’ll Fly Away” that gets the audience fired up, and “I Am Light of This World”—and Rosetta Tharpe repertoire including “Beams of Heaven,” “Didn’t It Rain,” and “Up Above My Head.” Granted the latter, accompanied by pianist Dave Keyes, aren’t as lively as the original renditions recorded over 60 years earlier, but Knight still has a fine, powerful contralto voice, capable of leaping registers. In between songs Knight offers a bit of storytelling and some powerful testifying, offering words of wisdom based on her lived experiences. 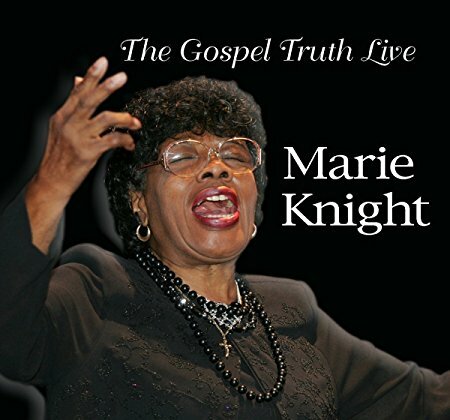 It’s these short sermons and her engagement with the audience that makes The Gospel Truth Live so unique—that and the fact that it’s Knight’s last recorded performance. The gospel doesn’t live in songs alone, and the context provided by this live performance is most welcome indeed. 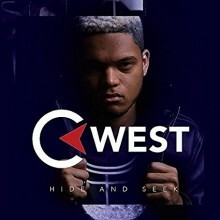 C West has potential to take the gospel world by storm with his debut album, Hide and Seek. The 20-year-old singer and guitarist incorporates a very contemporary R&B sound in his faith-based inspirational songs directed towards millennials. According to West, the album’s title references how we tend to hide from ourselves and from God, instead of seeking our true purpose. While studying at Villa Maria College in his hometown of Buffalo, New York, West competed in a singing contest sponsored by the well-known gospel producer Marquis Boone, who launched the careers of the chart topping Tyscot artists Briana Babineaux and Casey J. West went on to win the competition taking first prize, a recording contract with Tyscot Records. Now, with help from Boone, who is also his new manager, West is looking to push the envelope and merge mainstream styles with a spiritual message. Other tracks such as “Who I Am” and “Unusual Love” speak to finding yourself and your way through the world as young man or woman of God. As C West’s debut album, Hide and Seek signals the start of promising career and another win for Tyscot Records. Ok, real talk—I like gospel music. After all, gospel music is the ‘mothership’ of all black music: Mahalia Jackson, Sister Clara Ward, Shirley Caesar, and of course Aretha Franklin, who brought the church with her to Muscle Shoals, Alabama. The Staple Singers kept their gospel roots when they crossed over, as did the great Sam Cooke. The Hawkins Singers “Oh Happy Day” was broken on college radio. The New Jersey Mass Choir was brought to our attention when Foreigner had them sing backup on “I Wanna Know What Love Is.” And in the ‘90s, Jimmy Jam & Terry Lewis struck gold with the Sounds of Blackness when the single “Testify,” from the group’s national debut album The Evolution of Gospel, crossed over into dance and soul. 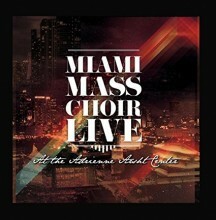 So, after listening to the Miami Mass Choir, where do they fit in? First off, when one thinks of Miami, gospel music is not the first thing that comes to one’s mind. Rev. Milton Bingham, the head of Savoy Records’ gospel division and founder of the Georgia Mass Choir, helped form the Miami Mass Choir in 1996 with Pastor Marc Cooper, the choir’s director and lead singer. Their 1997 debut album, Its Praying Time, produced the hit song “It Is For Me,” and was followed three years later with Just For You. On their new album, Live at the Adrienne Arsht Center, the Miami Mass Choir takes you to the mountain. The praise and worship song “Lord of Everything,” featuring Danette Inyang, is uplifting to the almighty high. They praise the King and thank him for all he’s done. That theme continues throughout the album. On “I Will Rejoice,” featuring Mark Cooper and Joy Cooper, the choir lets their hair down. Featuring a very funky bass, Marc Cooper talks via sermon, telling the audience to ‘praise him’ and the brass section pays attention. Other guests include Betty Wright, Beverly Crawford, Zacardi Cortez, JaLisa Faye and Avery Jones. The Miami Mass Choir isn’t necessarily looking to get into the top 40 with this album, though the radio single “Lord of Everything” is climbing the charts. Live at the Adrienne Arsht Center is traditional enough to keep the old timers, while incorporating new sounds to draw newcomers. Raise your hand and close your eyes! Well thank you. After more than fifty years, fans of Dee Dee Sharp can once again hear her long out-of-print album, Songs of Faith. Perhaps now fans, and others as well, will finally come to realize that Dee Dee Sharp accomplished more in her career than (1), her 1962 hit “Mashed Potato Time,” and (2), being married to Kenny Gamble. Strange but true, “Mashed Potato Time” was knocked out of place by Little Eva’s “The Loco Motion,” a song Gerry Goffin & Carole King wrote and offered to Sharp, who turned it down. 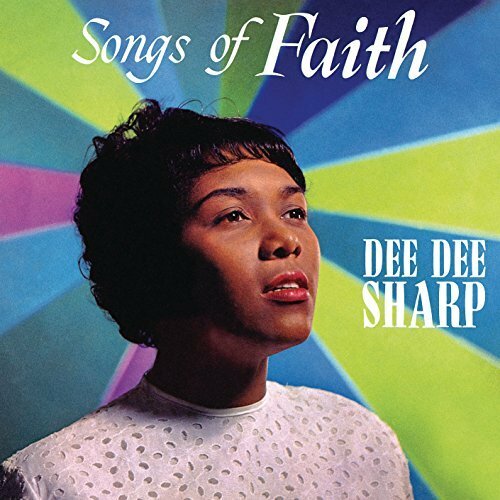 Instead, Dee Dee Sharp went to New York in 1962 to record Songs of Faith, which immediately followed the release of her debut album, It’s Mashed Potato Time. In Songs of Faith, Sharp—who sang in Philadelphia’s Third Eternal Baptist Church where her grandfather was pastor—shows a vocal range that “Mashed Potato Time” could never give justice to. The opening track, an arrangement of Thomas Dorsey’s “Peace in the Valley,” sounds more like a tune suited for the Lawrence Welk show and the Lennon Sisters with its lush orchestral backing. “No more sadness, no more troubles,” sings Sharp. With the recent affairs after the election and all its chaos, healing words indeed. “He’s Got the Whole World In His Hands” may also sound hokey and out of date to a young audience, but remember, this was first released in 1962. On “Its No Secret (What God Can Do),” Sharp sounds like one of her contemporaries during this time—Barbara Lewis of “Baby I’m Yours” fame. “Up Hill” no doubt is the winner, with organ filled hand clapping. When you listen, one can picture a congregation standing in the pews, clapping, while the choir director leads the choir. “Keep a singing” is right. After listening to all twelve tracks, I have to wonder why this original wasn’t album pushed more by the label. Bad marketing. After releasing “Mashed Potato Time,” Sharp introduced a dance that went with the single, creating a major hit which brought her to mainstream attention. If Cameo/Parkway had released this inspirational album before “Mashed Potato Time,” perhaps it might have been more successful. Or Sharp’s star might have shined brighter if Cameo had released a true gospel album, instead of a collection of pop-oriented inspirational songs recorded in the studio. Because of this, Songs of Faith can’t go toe to toe with the likes of Clara Ward or Mahalia Jackson, even though Sharp was a great gospel singer and is backed here by Philly gospel artists Willa Ward, Vivian Jackson, and Mary Wiley. Still, it’s great to hear another side of Dee Dee Sharp. Liner notes are provide by George Washington University professor Gayle Wald, author of the Sister Rosetta Tharpe biography, Shout, Sister, Shout. Founded in 1959 in L.A. by Sylvester C. “Duke” Henderson, Proverb Records, and its affiliated Gospel Corner label, were a natural outgrowth of Henderson’s entrepreneurial activities. Over the course of his career he worked as a deejay and concert promoter, songwriter and publisher, owned a record store on South Central Avenue, served as gospel director for Kent Records, and was an ordained minister. He was also a successful R&B singer and recording artist, but around 1955 had a religious conversion. Like Little Richard, Henderson decided to forsake the secular, turning to the gospel music on which he was raised. Henceforth he was known as “Brother” Henderson. Though his life was cut short at the age of 48, he managed to build an impressive record catalog. 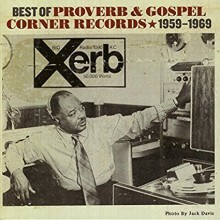 Best of Proverb & Gospel Corner Records was compiled by noted Swedish gospel reissue producer and historian Per Notini in an “attempt to pay a long overdue tribute to Brother Henderson’s legacy.” Across the 52 tracks, one finds a mix of famous and lesser known artists. During the decade spanning 1959-1969, L.A. had become “the capital” of Black gospel music, and Henderson recorded visiting gospel luminaries as well as local artists. His eclectic catalog included soloists, gospel quartets, choirs, sermons, lining hymns, and even sacred steel guitar. The set opens with the Mighty Clouds of Joy performing “Jesus Is Real,” made significant by the fact that Henderson shares the songwriting credit with Joe Ligon, and he was also responsible for releasing the group’s debut album, Let’s Have Church, a few years prior. The Chambers Brothers are also featured here in their only gospel side, “Just a Little More Faith.” Rarities include a live recording of Rev. W.E. Jasper of Little Rock, Arkansas lining out the hymn “Father I Stretch My Hands To Thee,” the Thomas Housley & Family of Oakland’s rocking performance of “God Is a Wonder,” and Madame Nellie Robinson’s soulful anti-war song “Viet Nam.” Other groups represented on the compilation include the Pilgrim Travelers, Singing Corinthians, Vocal-Aires, Los Angeles Angels, Hampton-Aires, Prince Dixon, and many more. Henderson himself is well represented in this collection. His single, “Eleven-Twenty Two Nineteen Sixty Three,” credited to Brother Henderson Religious D.J. of Los Angeles Co., is based on his own poem written as a reaction to the murder of John F. Kennedy. There are also sides from various groups he founded, including Brother Henderson’s Spiritual Lambs, and the youthful Watts Community Choir led by Dee Jae Rogers (aka ‘70s soul singer D.J. Rogers). Best of Proverb & Gospel Corner Records is a fantastic compilation that perfectly encapsulates the wide range of gospel music popular in the 1960s, from traditional gospel to rock and soul based songs with psychedelic guitar riffs—while also documenting little known gospel groups. Even better, it serves as a fitting tribute to Brother Henderson, who life’s work is finally available once again for all to enjoy. 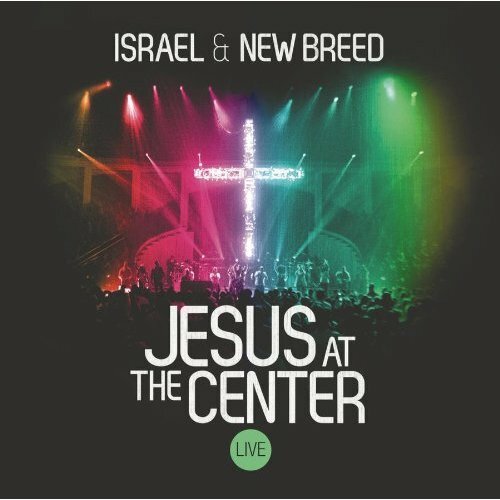 Delivering its message of praise and worship to fans for over 12 years, Israel & New Breed sounds as good as ever on the group’s new live album, Jesus at the Center. Since the release of their last album nearly 5 years ago, band leader Israel Houghton has released solo works, many of which have won several awards including a Grammy. This double album, which includes 17 live-performance songs and 3 studio singles, will fulfill the expectations of long-term fans while attracting new audiences. It channels the atmosphere of the concert at Lakewood Church in Houston, Texas, where Houghton is a worship leader, and captures all the highlights of their inspirational performances. Houghton states in the liner notes, “We purposely wanted to emphasize being a resource to the church worldwide. . . There is literally something for everyone to connect to.” This album does indeed provide music for the cross-cultural audience of churchgoers worldwide. Disc 1 presents the first half of the concert, during which Israel & New Breed amp the audience with up-beat songs. 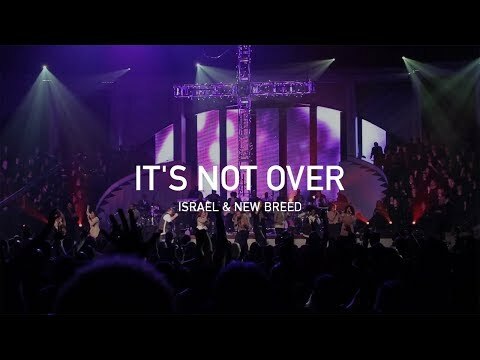 The concert begins with each member of New Breed singing parts of “Jesus at the Center” while Israel reads from Colossians 1:15-20. They kick off the music ministry with “Jesus the Same,” which exemplifies their sound with powerful beats and horns. Their simple and highly melodic songs invite audience members to participate in the spiritual experience of the music. The group moves to another powerful tune, “Rez Power,” and further elevates the audience’s excitement. “No Turning Back” has grooves that make you want to dance; “Te Amo,” (meaning “I love you” in Spanish) will make you dance even more; and “More Than Enough” will surely keep you dancing. This last half of the concert also contains several medleys, “Hosanna/ Moving Forward/ Where Else Can I Go,” “You Have Me/ You Hold My World,” and “To Make You Feel My Love/ Name of Love” (on which Houghton’s teenage daughter, Mariah, is featured). “To Make” is a wonderful rendition of a little-known Bob Dylan song, followed by “Name of Love” whose sound really captures the church’s serenity. Israel and his daughter’s smooth voices blend together and transform this song about romantic love into one about spiritual love. 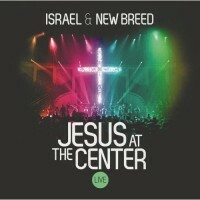 Jesus at the Center will surely make you smile and sing and feel thankful for the many talents of Israel & New Breed. Fire In My Bones features 80 amazing gospel performances that you’ve probably never heard but really should. With able assistance from Kevin Nutt of WFMU’s “Sinner’s Crossroads” and a handful of dedicated gospel music collectors, Mike McGonigal assembled this three-disc set of out-of-print and obscure selections. An admirably-compiled and illustrated companion booklet provides as much detail on the recordings as is available. This eclectic and electrifying collection is different from other compilations of gospel classics in that it does not focus exclusively on a specific location, gospel music style (e.g., quartet), artist, record label or timeframe. It also doesn’t line up tracks in chronological order. Establishing loose time parameters of 1944 to the present day, the collection leaps back and forth with glee between decades. Its unifying thread is the raw and genuine emotion expressed in musical performances and sermonettes by largely-forgotten performers and ministers. The singers and musicians are so rooted in the old time way, in fact, that it is often difficult to aurally define a song’s vintage by the performance alone. Fire In My Bones draws on a variety of sources: mostly old 78s and 45s but also field recordings made by modern-day Alan Lomaxes in search of the untarnished. This is not to suggest that it contains all unknowns; the set also includes examples by well-known gospel artists such as Elder Samuel Patterson, Little Ax & the Golden Echoes, Rev. Robert Ballinger and Prof. J. Earle Hines. But for every track by Sister O.M. Terrell, Marie Knight and Lucille Barbee, who managed to eke out 15 minutes of fame (or more) in their day, Fire In My Bones introduces other equally intriguing but lesser-known performers such as the Hickory Bottom Harmoneers, Willie May Williams, and the Straight Street Holiness Group. The compilation leans heavily on the sounds of the Sanctified Church, where any instrument is fair game as long as it gives praise. Electric guitars play a prominent role in Fire In My Bones. One recording in particular, “I Made a Vow to the Lord,” originally released in 1953 on Elko Records, sounds so much like Elder Utah Smith, it wouldn’t be surprising if it actually is Smith under a pseudonym. After all, Elko issued a 78 by a “Sister Christine” which was really a well-known coupling on BBS by the Clara Ward Singers. The CD booklet presents brief stories behind the music that are often as fascinating as the performances themselves. The selections from Rochester, New York’s Fine Records, for instance, would never have made it to this compilation had they not been saved from complete deterioration by Australian Mark Taylor. Taylor purchased the entire contents of the already-dilapidated studios and shipped them thousands of miles, square-inch by square-inch, to his home for cleaning and restoring. Or Elder Roma Wilson and Family, a harmonica band who in 1948 became unwitting recording artists. They made a test recording in Detroit, but later found out their performance was released commercially on Philadelphia’s famed Gotham Records. 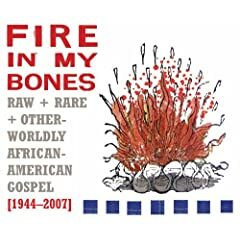 What Fire In My Bones tells us, more than anything, is that the vein of astonishingly honest and powerful gospel recordings is rich, exciting, overwhelming, and the largest remaining frontier in American music collecting and archiving. NOTE: A portion of the proceeds from the sale of Fire In My Bones will benefit the New Orleans Musicians Relief Fund. 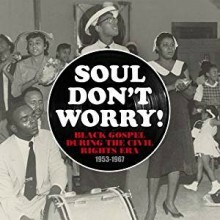 Reviewed by Bob Marovitch, Editor, The Black Gospel Blog (reprinted with permission from the author; copyright 2009 by Robert M. Marovich). Following (in three parts) are short reviews of several gospel music CD releases from the first quarter of 2009. While there are many others that could and should appear on this list, I chose to present these projects based on a few criteria. For instance, some are highlighted because they present new music from performers who have experienced an extended absence from the industry as recording artists. Other releases were chosen based on their abundant airplay and high placement on chart listings. In addition, some appear as a result of the artist’s presence in the gospel music industry over time. Nevertheless, the aggregate of these artists exemplify gospel music spanning traditional and contemporary styles. 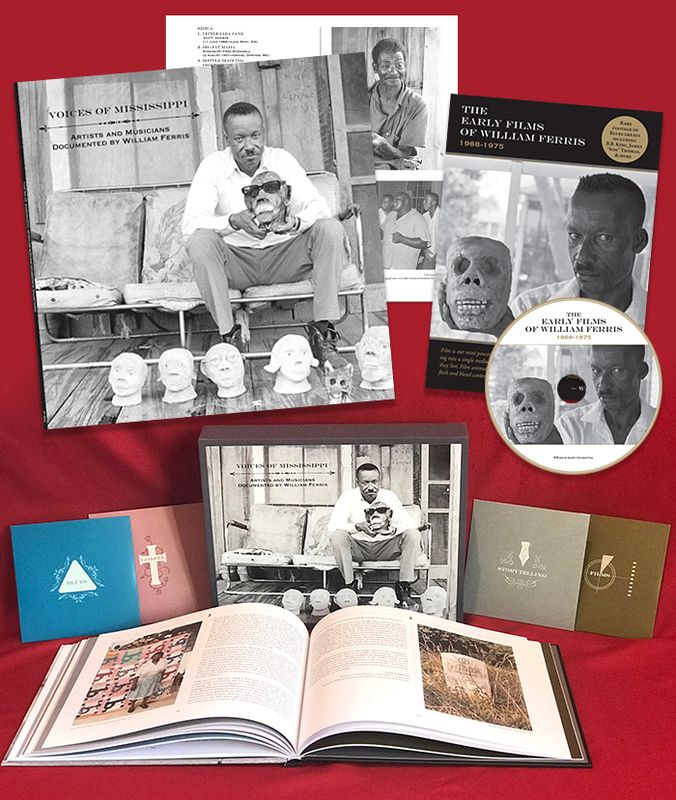 My hope is that the reader will identify with at least one of the highlighted CDs, which might lead him/her to explore other projects by the same artists along with those who perform similar styles, thus expanding their knowledge and experience of this religious artistic expression that is gospel music. 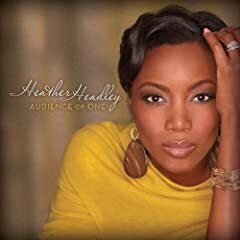 Heather Headley’s new release, Audience of One, might lead some to assume that the R&B singer has crossed over into the gospel music industry. However, given her background (her father was a pastor) as well as her soulful delivery on this project, its apparent that Headley never left the church. Steeped in lush orchestrations and soulful, eclectic grooves, Headley presents a vocal gem consisting of tonal clarity, well placed phrasing, and emotional drive. Put succinctly, she gives thoughtful worshipers a musical vehicle by which they can mull over the goodness of God and the significance of dependence upon Him. For a clear example of her renderings listen to “Simply Redeemed,” “I Need Thee Every Hour,” the churchy “I Know The Lord Will Make a Way” and “Here I Am To Worship.” With special appearances by Smokie Norful and the Tri-City Singers, along with arrangements by Keith Thomas, Marc Harris and Cedric Thompson, Audience of One will resonate across racial, denominational and generational boundaries. Donald Lawrence continues to prove why he is one of gospel’s most sought after artists/producers. 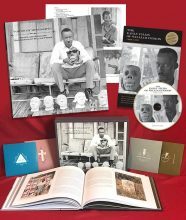 With his newest release, Law of Confession, recorded live in Chicago at the Living Word Christian Center, he illustrates in song how words have the power to change life circumstances. The 14 tracks are based on a book and sermon entitled Law of Confessions by Rev. Bill Winston, the pastor of Living Word where Lawrence is a congregant. 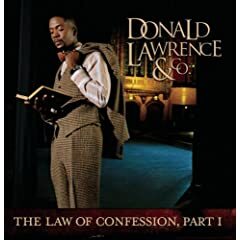 The title track, “Law of Confession,” sums up the entire album, as Lawrence challenges the live audience to begin speaking the words of the Lord over their lives. The song “Back II Eden” has also proven to be an enormous hit among the gospel audience, with its message of prosperity promised by God, which allows for “Kingdom people” (Lawrence’s term) to “live on top of the world.” Also very powerful is the rendition of “The Blessing of Abraham,” which was performed as a reflective ballad in contrast to the original up-tempo version recorded by Lawrence in 2006. This ballad style allows for “Kingdom people” to internalize the covenant between God and Abraham as well as his descendants. It is enough to usher the listener into a mode of worship. Every song on this CD could be used as a tool for shifting the mindset of the listener from a state where anything is accepted to a place where one dictates, through the word of God, what his or her life will be. The project is musically excellent and Biblically sound. The Law of Confession is a must have! 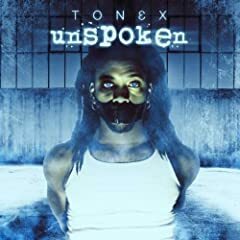 Unspoken not only speaks to a broad audience beyond the traditional church, but also gives us a better understanding of Tonex as a person. He has come through many trials and, therefore, has an enormous range of sounds and images to offer the diverse body of Christ. The Supreme Angels are continuing the legacy of sincerity and dedication to gospel quartet music that the late Howard “Slim” Hunt (who passed away in 2007) developed over several decades. 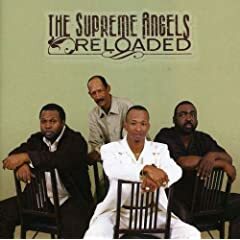 With Reloaded, their new release for Malaco, the Supreme Angels maintain the group’s traditional character while also creating a more contemporary sound through the lead vocals of Quincy King, Hunt’s son. While all of the songs demonstrate contemporary gospel quartet performance styles, the opening track, “Wicked Land,” is an up-tempo original that illustrates the essence of the current genre with its great story-line and tight harmonies accented by synth horns and a driving rhythm section. “Hold On and Never Give Up” is another notable track couched in a moderate tempo groove that challenges the listener to maintain faith in God no matter the circumstances. Other worthy songs are the bluesy “Don’t Let the Devil Steal Your Joy” and the solemn rendition of “I Need Thee.” Reloaded allows the listener to experience an accurate representation of gospel quartet music that is simplistic, thoughtful, earthy and, most important to believers, the message of God in song. 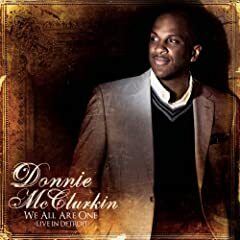 After a five-year break, Donnie McClurkin released his eighth CD, We Are All One, for Verity, which was recorded live in Detroit at the Straight Gate International Church. This project consists of 14 tracks illustrating styles from Black Pentecostal church music (“You Are the Great I Am”) to the praise and worship phenomenon that is sweeping the Sunday morning service (“You Are My God and King”). While this project presents more of the same (for those who are familiar with McClurkin’s dynamic performance style), it also expands the artists’ musical parameters by including rock and symphonic elements as well as collaborations with CeCe Winans, Yolanda Adams and Mary Mary, among others. Notable tracks are “Wait On The Lord,” “Trusting In You,” “Purple,” and “Hallelujah Song.” However, the entire project reflects the essence of McClurkin’s distinct style of delivery, which focuses on sound musicianship and the ability to make God applicable to the listener. Kim Burrell is back with a fresh approach to gospel music after nine years without a new solo project. Her latest release on Shanachie, No Ways Tired, consists of hymns, gospels and even a George Gershwin piece in Burrell’s eclectic style of delivery. This album, produced by Burrell along with Chris “Big Dog” Davis, demonstrates why Burrell is still considered a vocal powerhouse. She has mastered various music genres and has successfully positioned them in the context of Black religious music. The 12 tracks, which include a prelude and postlude, will leave one desiring more of Burrell’s melodious ministry in song. For clear examples of such ministry one could search through any track. 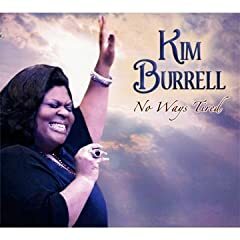 If you have a desire to get straight to it, just listen to “No Ways Tired” and “Yes To Your Will.” Kim Burrell continues to amaze us with her tremendous gift. This project was worth the wait! 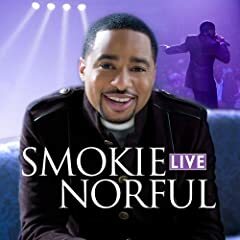 Smokie Norful’s fourth album, Live, is a collector’s item for diehard gospel music lovers. This 10 track project, recorded live in Memphis, is funky, soulful, and most of all, its ministry. On the funky side there is “I Will Bless The Lord.” If you want to hear soulful listen to “Don’t Quit.” In addition, “Justified” is the quintessential song of ministry on this CD, although all of the tracks minister in a specific way. Notable is “Jesus Is Love,” a duet between Norful and Heather Headley. This orchestrated version of the Commodore’s 1980 hit has an emotional drive that builds to a climax, and parallels the developing character of a traditional Sunday morning sermon. Simply put, this album is a must have for those who are interested in music that not only feels good, but also speaks directly to the conditions of those who realize the power of God in their daily lives. When I first met the “Gospel Storyteller,” Dorothy Norwood, in the early 1990s, I was unnerved to come face to face with a diminutive, smiling, pleasant woman. She seemed more like a sweet auntie than what I expected a church-wrecking singer who could bulldoze her way through a hymn until the notes begged for mercy to look like. Nearly two decades later, Norwood looks and sounds just as good and strong as she did back then. As a tribute to a half-century as a gospel soloist, the former Caravan delivers a series of traditional gems on Fifty Years – It’s Been Worth It All. The original versions of some tracks, such as “Denied Mother,” defined her style and placed her on the express lane to stardom. Mother, in fact, is a very important theme on Norwood’s new retrospective. No less than four of the thirteen songs on the album deal with a praying, teaching, loving mother. This includes the aforementioned “Denied Mother” (on the CD, Norwood performs the story song for a live audience) and “Tribute to Mama,” which bestows ultimate honor to a mother who can teach her children right from wrong. Another Norwood favorite featured here is the congregational classic “Victory is Mine,” which benefits from ample vocal backing by the exciting Ricky Dillard and New G.
To this day, Norwood still leaves scorch marks on my speaker cones as she rip-roars through songs such as “I Have a Friend” and the old favorite “My Rock.” From the opening rouser “I Thank You Lord” to her earth-shattering renditions of “Precious Lord” and “I Will Trust in the Lord” during the live version of “Denied Mother,” Norwood acknowledges that yes, it’s been fifty years…yes, it’s been worth it all… and yes, she can still out-shout the shouters and send sinners single-file to the mourning bench just like singers half her age. A superb outing from a master! Editor’s Note: Bob has been the host of WLUW’s “Gospel Memories” radio show since 2001. Starting this month, you can now hear “Gospel Memories” live on 88.7 WLUW Chicago every Saturday morning from 10 to 11 a.m. Go to http://www.wluw.org/, click the Listen Live button, and enjoy “Gospel Memories” from wherever you may be! In 1975, performer/scholar Pearl Williams-Jones wrote an article entitled “Afro-American Gospel Music: A Crystallization of the Black Aesthetic,” where she illustrated how gospel music represents the totality of black aesthetic expressions. Ultimately, her interpretation of the genre not only presented gospel music as a religious art form, but also as a vehicle for bridging the gap between sacred and secular practices in black music. Oh Happy Day: An All-Star Music Celebration, a new release by EMI Gospel, is a contemporary manifestation of Williams-Jones’ notion of gospel music, as it highlights duets between religious and mainstream music artists: Johnny Lang is paired with the Fisk Jubilee Singers, Robert Randolph with the Clark Sisters, Al Green with Heather Headley, and 3 Doors Down with the Soul Children of Chicago. This CD is a tribute to gospel music that is long overdue, as the genre has functioned as a breeding ground for many of the mainstream music industry’s top artists from Sister Rosetta Tharpe to Curtis Mayfield to Fantasia. In fact, gospel music has constantly shaped the performance practices and, essentially, the sound of American popular music. Some of the highlighted duets– such as rocker Jon Bon Jovi with The Washington Youth Choir as well as R&B diva Mavis Staples with Patty Griffin– are overly ambitious and do not necessarily capture the gospel feel (a qualitative performance character), or are unevenly matched vocally. Nevertheless, there are several jewels on this project such as the rendition of the Impressions 1965 single, “People Get Ready” by the Reverend Al Green and Heather Headley. Green and Headley’s extended vocal range and elongated phrasings are superbly complimentary. In addition, their ability to pace their individual ad libs creates mature vocal placement, which keeps them from over-singing and over-shadowing each other. This track is a good source for novice singers who are searching for an example of how to execute soulful music with patience. “Oh Happy Day,” featuring Queen Latifah with the Jubilation Choir, represents another notable duet on this project. Queen Latifah’s smooth and warm vocals parallel the rounded and legato phrasing of the Jubilation Choir. In addition, the instrumental accompaniment on this track illustrates a quintessential example of sacred/secular fluidity in black music. The Earth, Wind & Fire styled horn riffs, guitar lines incorporating bluesy and churchy vocabulary (if there is a difference), and vamp reminiscent of Sunday morning worship services, all merge to form a distinct sound that resonates within the traditional black church as well as the broader mainstream community that appreciates soul music. “I Believe” presents the soulful vocals of Johnny Lang and the Fisk Jubilee Singers. This song paints a picture of a southern-based gritty, communal, hand clapping and foot stomping church deep in the back woods where all the saints are on one accord expressing their commitment to faith in God’s word. Lang’s raspy vocals create the feel of the shouts and squalls of the black preacher, while the Fisk Jubilee Singers’ background harmonies and rhythmic execution reflect those in the “amen” corner whose excitement for the gospel spreads throughout the congregation (and in this case, the listener), prompting others to sing along with similar conviction. In addition, Lang’s guitar playing, grounded in the blues tradition, meshes well with the down home ambiance of the track. These tracks, along with others on the CD, reflect an ongoing tradition in black music where sacred and secular practices co-exist. They also illustrate the fact that gospel music transcends boundaries of race, gender and generation. 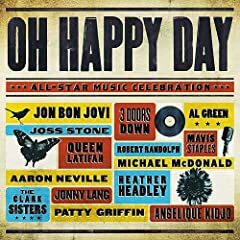 More importantly, Oh Happy Day: An All-Star Music Celebration presents timeless songs that have assisted in developing and sustaining the beliefs of people throughout the world. It is a must have for those who desire to revisit the more traditional gospel music repertoire in a unique and contemporary way. 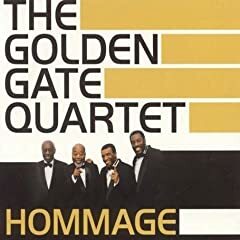 There have been many compilations devoted to the Golden Gate Quartet, one of the oldest and most beloved of all the jubilee/gospel vocal quartet groups, and the latest addition is the double disc Hommage released by Buda Records. Compiled and annotated by Christian Bonneau, the accompanying booklet is illustrated with many historical photographs and contains a chronological history of the group and its members, which have changed considerably over the 60 plus years of the group’s existence. The set seeks to pay tribute to the various “Gates,” with particular emphasis placed on live recordings made in France, the group’s official home since 1959. Though most historical compilations are arranged chronologically, Hommage begins in 1997 following the retirement of tenor Clyde Riddick, whose tenure with the group lasted over 50 years, from 1939-1994. The opening track is a rendition of “Soon, I Will Be Done,” recorded at the St. Sermin cathedral in Toulouse, France in 1997. Ten additional tracks from this concert are interspersed throughout the set and feature Frank Davis (1st tenor since 1995), Charles West (2nd tenor from 1934-39), Henry Owens, Willie Johnson, and Orlandus Wilson. tenor, 1995-1999), Paul Brembly (baritone since 1971), and bass Orlandus Wilson, one of the founding members of the group who died a year after this concert. Over the course of the set, the tracks skip around in time, interspersing the earlier a cappella material with later songs accompanied variously by piano, guitar, and rhythm combo. The Golden Gate Quartet’s first recording, their famous rendition of “Gospel Train” with a soaring tenor over syncopated vocalized “chugging,” is included on track 10. Recorded August 4, 1937 in Charlotte, North Carolina, “Gospel Train” features early group members William Langford (1st tenor from 1934-39), Henry Owens, Willie Johnson, and Orlandus Wilson. Other a cappella songs by this same group include an innovative version of the jazz standard “Dipsy Doodle” (one of the few secular arrangements on the set) and “Lead Me On and On” (from Jan. 24, 1938), “Let My People Go” (a.k.a. “Go Down Moses” from 1939), “Noah” (Feb. 2, 1939), and “I’m a Pilgrim” (Oct. 6, 1939). After Langford was replaced by Clyde Riddick in 1939 the line-up was fairly stable for the next decade, except for some substitutions during WWII. Hits from this era, all recorded stateside, include “Didn’t It Rain” from 1941; a jazzy version of “Shadrack” along with “Run On,” and “Hush!” from 1946; and “Amazing Grace” and “I Want Two Wings” from 1949, among other favorites. The final New York sessions on the set feature two more secular arrangements from 1952, “Lover Come Back To Me” and “Careless Love Blues,” featuring pianist Conrad Frederick, a well-known New York session musician who also ad libbed during the 1949 sessions. The remaining tracks on the set were all recorded in Europe between 1955-1997 and include material less generally available in the U.S. Locations range from recording studios in Boulogne, Berlin and Paris to live concerts at various churches in France. Several of their traditional numbers are reinterpreted, such as “Good News” and “Jericho” which are backed by a combo, and “Deep River,” which is accompanied by an unidentified church choir. These contemporary arrangements, though all well sung, lack the spontaneity as well as the rhythmic and stylistic variety of the earlier recordings by the group. The set concludes with a seven minute history of the quartet narrated by Orlandus Wilson and recorded at his Paris home in 1980. Though no new information is imparted, its nice to hear the Gates story in Wilson’s own words, even though he seems to be reading from a script and the narration is punctuation by songs and applause, which is often distracting. Extensive liner notes are presented in French and English, but the translation is quite stilted and would have benefited greatly from a copy editor. Though performers, recording dates and places are all documented at the end of the booklet, it’s a bit difficult to match them to the individual tracks since the order is not chronological. If you’re a traditionalist, you’ll probably be better off purchasing compilations of the Gates’ pre-1950 recordings. However, if you want a broad overview of the Golden Gate Quartet’s career and enjoy contemporary renditions of the classics, this set will deliver. For the past two decades, the Mississippi Mass Choir, founded by the late Frank Williams of the Jackson Southernaires, has developed and maintained a reputation as an ensemble with impeccable musicianship. More importantly, they are known for their collective evangelic nature, which takes the Sunday morning worship service everywhere they go. The First Twenty Years, the choir’s newest release, celebrates their longevity in the gospel music industry. This twelve track compilation illustrates both of these characteristics. The songs are taken from five earlier albums that present the songwriting talents of well-known artists and producers such as David Curry Jr., Walter Hawkins, Dorothy Love Coates, Frank Williams and Rev. Milton Biggham, amongst others. While most compilations possess two or three real musical gems, this project is full of hits. Simply play the CD from beginning to end and it will be a rewarding experience. For instance, “Near The Cross” presents a timeless interpretation of Fanny Crosby’s popular hymn via Frank Williams’ solo vocals and the choir’s tight triadic harmonies in the traditional gospel quartet singing style. “Having You There” has an infectious medium tempo groove and meaningful message of gratitude for God’s presence in one’s life. This is a quintessential example of vertical praise. “Your Grace and Mercy” positions the listener in a Sunday morning worship service. The song’s lyrics highlight God’s goodness reflected in His abundant grace and mercy that shields all from hurt, harm and danger. It is a declaration of God’s works in an old time fashion that resonates with past and present saints (Christians). Frank Williams’ solo vocals are carefully placed in such a way that they create space for hollers and shouts of the audience as the spirit of God is ushered in. “When I Rose This Morning,” lead by Mother Mosie Burke, is a handclapping, foot-stomping testimony of faith in God. If you like gospel quartet music, African American call and response tradition, the blues, the vamp, improvisation (ad-libbing) and shout music, this song is your lecture/demonstration workshop. Finally, “Jesus Paid It All” takes us back to the days when the late Rev. James Moore dominated gospel radio. 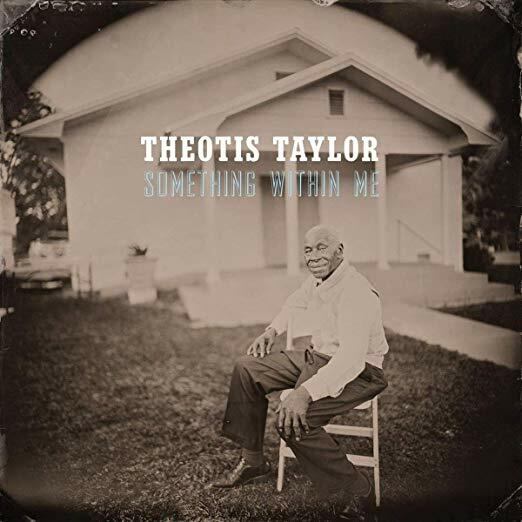 His lead vocals, particularly in this song’s introduction, illustrate the true essence of gospel singing that mirrors a core-Black preaching style. His vocal quality shifts, his “appropriate” use of melismas or runs (as they call them in the Black church) and his gradual buildup to a climax are all characteristic of this phenomenon. The Mississippi Mass Choir has released an artistic and evangelical treasure of songs that illustrates their ability to maintain their iconic sound and style in an industry that tends to change with the newest trends. More importantly, for two decades the ensemble has given the listener a meaningful tool to use when reflecting on the magnificent presence of God in the lives of Christians. 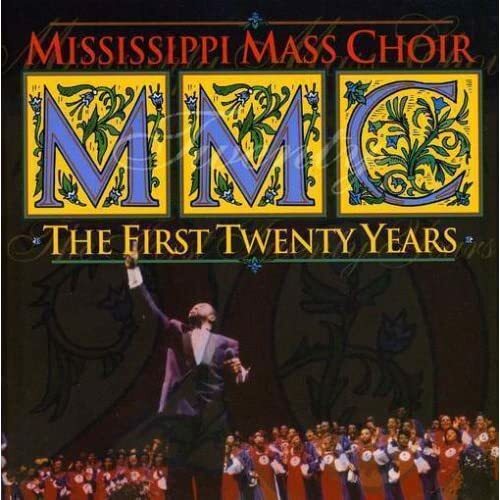 One can only wait with great expectations for “The Second Twenty Years.” Until then, The Mississippi Mass Choir: The First Twenty Years will keep us busy praising! !